Equipment-driven rental projects really call for “one-stop” or centralized insight for success. You need to ensure that you meet budget, requirements, and timeline for a single project. In many cases, you may be handling multiple projects that call on you to coordinate equipment, manpower, transport, etc. So that activities and availability don’t overlap. Full insight into scheduling, execution, and financials needs to be both holistic and granular. Planners must be able to move quickly from a big picture view of availability and status across a project portfolio. Into the details that make up every rental project. Even more important, they need to be able to act on that insight without confusion or mistakes. DynaRent Graphical Planning for Microsoft Dynamics 365 for Finance and Operations (and Microsoft Dynamics AX) offer planners instant, complete overviews. For all equipment, resources, and job requirements, along with drill-back into granular details. Working in one window and a single process, they can coordinate all aspects of multiple projects. Assign equipment and resources with confidence, and ensure that changes and communications are right the first time. Integrate the graphical board in real-time with all information about equipment inventory across locations and depots. You’ll have quick drilldown into all information about availability, condition, service needs, and optimal resources for operating and transporting equipment. Your resource planning works hand in glove with equipment insight. DynaRent Graphical Planning for Microsoft Dynamics 365 for Finance and Operations lets you set up resource groups associated with different activities and equipment, so that you can efficiently assign operators and service techs to specific activities for specific equipment. This is particularly helpful when you’re dealing with equipment projects that require different skillsets across diverse locations—DynaRent Graphical Planning for Microsoft Dynamics 365 for Finance and Operations enables you to be precise from the start. This is part of the dashboard’s design. For example, if you are running 4 mobile crane projects and one operator calls in sick, planners can immediately access all resources qualified to operate the crane, along with their schedules. They can quickly assign the job to another operator’s schedule using drag-and-drop functionality. All information related to the job and equipment transfer automatically, and updates are instantly reflected in DynaRent Graphical Planning for Microsoft Dynamics 365 for Finance and Operations. Resource schedules also re-align automatically. Because there’s a complete view of all projects, planners can reschedule wisely—if the sick crane operator’s job is more urgent than another one and resources are tight, they can postpone the less urgent job. When they reschedule, all information and tasks related to resources, crane, other equipment, transport, and such move automatically to the new date/time. Planners can create new jobs directly from the planning overview using an efficient process that ensures all information is complete and accurate. When you’re creating multiple jobs within a day this standardized efficiency is essential. With complete overviews of equipment, resources, and transport, planners can orchestrate profitable rental projects while protecting quality and accuracy. Because they can access and work with all variables directly from the graphical dashboard, you can count on well-coordinated oversight every day for multiple projects. 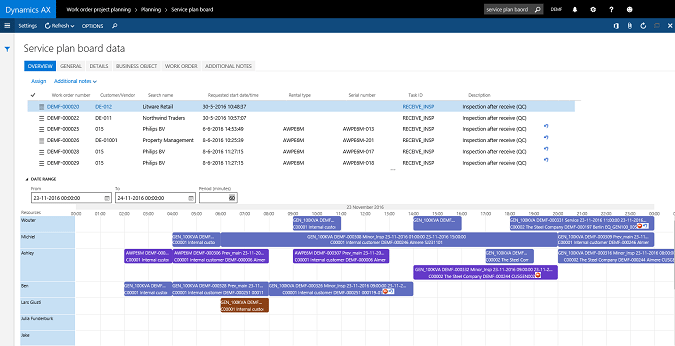 From initial assessment, to coordinating and scheduling, to sending complete work orders with all communications directly to workers’ mobile devices, DynaRent Graphical Planning for Microsoft Dynamics 365 for Finance and Operations (and Microsoft Dynamics AX) keeps everything organized via rich graphical planning boards.